French is constantly striving to find improvements to help our customers reach the maximum efficiency in their processes and operations. French continually reviews designs to seek out ways to improve the key components for all types of our machinery from hydraulic presses, rubber mixers, oilseed equipment, polymer equipment, and fiber presses. Over the last 30 years, technological improvements in metallurgy, energy usage and machine control systems have often allowed French engineers to redesign systems in such a way as to add real value to our customers. These improvements often have direct and immediate effects on your company’s bottom line by reducing productions costs and/or improving your process outputs. Choosing between electrically heated platens, oil heated platens or steam heated platens for your hydraulic press system can have an impact on the cost effectiveness of your manufacturing process. French can retrofit your heated platen press systems to a different heating method, such as converting your steam heated platens with electrically heated platens, which may reduce operating costs. The Edge II Control System can increase the ability to maintain consistent production quality. In addition to recipe creation and storage, the PC based system allows several customizable security levels and critical data collection. 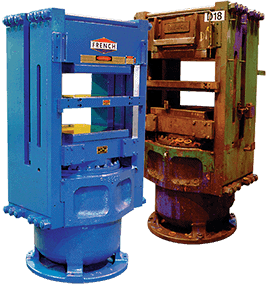 Learn more about our hydraulic press control system upgrades and retrofits.